What remains today of the sports complex 'Warszawianka' is a ruin, but a skilful eye would be able to trace remnants of its unique architectural concept developed by Artistic and Research Unit of the Academy of Fine Arts in Warsaw. The group, led by Jerzy Sołtan, created one of the most innovative constructions in Poland. The complex, comprising swimming pools, tennis courts, a stadium, and all infrastructure that its future users could need, was created in the 1950s and 1960s. The main part of the object was constructed between 1954 and 1962, and in the second stage of construction (1960-1973) the swimming pools were finished. The architectural contest for a project of a sports complex was announced in 1954. Curiously enough, two completely different plans made it to the final stage. One of them was in accordance with the aesthetic/political doctrine of socialist realism, prevalent in Poland under communist regime at that time. The buildings were supposed to have historicist forms, stylistically resemblant of the nearby Królikarnia palace. The second project, created by the Artistic and Research Unit of the Academy of Fine Arts in Warsaw, reached far beyond architectural standards common at the time, and proposed creating a development with modern edifices meticulously composed into the landscape. Even though officially socialist realism in art and architecture stopped applying only in 1956, it was already two years earlier that it begun to be criticised and some suspected it would soon fall. Most likely, the Artistic and Research Unit's innovative vision was awarded the first prize in the competition for the project of 'Warszawianka' complex. 'Warszawianka' was the first project developed by Sołtan and Ihnatowicz's team. It was at this occasion that the group was transformed into the Artistic and Research Unit, a unique undertaking thanks to which architects, urban planners, painters, sculptors, designers and engineers could co-operate within one team. Their objective was to create works we would today call interdisciplinary. 'Warszawianka' was a fine example of implementing that idea. The sports complex was to be build on an escarpment by the Vistula river, neighbouring Królikarnia Palace and the modernist St. Michael Church. The designers decided to put more emphasis on the context of the landscape. The team, comprising Jerzy Sołtan, Zbigniew Ihnatowicz, Lech Tomaszewski, Włodzimierz Wittek, Wiktor Gessler and Wojciech Fangor, located a complex of sports facilities in such a way that in every spot of 'Warszawianka' the visitors could enjoy the view on Vistula river's valley (today the panorama of the oxbow lake is no longer visible due to urban constructions). The main materials were not many: concrete (as it is durable and does not require a lot of care) and… greenery, soil and water. Thanks to an analysis of the natural conditions of the escarpment, the architects worked out open-work concrete walls, serving as the basis for the arrangement of the terrain. They composed them into the natural shape of the location and the open-work walls allowed the water to float freely on the slope. On the terraces, supported by retaining walls dug into the ground, swimming pools, sports fields, courts, and amphitheatrical stands were located. The placement of the parts of the complex was well thought-out, for instance the courts or spots meant for sunbathing were covered from the wind with trees or earthworks. At the top of the escarpment there was the so-called 'referees' house', also called a tennis pavillion – a sleek building cut with vertical stripes of windows. Its form is indicative of the designers being inspired by Le Corbusier's works, for instance the chapel Notre Dame du Haut, designed in 1950 for the town of Ronchamp (this should not come as too much of a surprise, since Jerzy Sołtan has worked in Le Corbursier with Paris for four years). … it's an example of a spatial-poetical lecture about the Earth, about the possibility of Nature's and Man's Activity's coexistence. Jerzy and his team managed to comprise it in the realisation of three different forms, each having its own relationship with the sky and horizon, on the terrain of 'Warszawianka' stadium in Warsaw. First of all, the form of a stadium, allowing each one of us physical experience of Earth's scale: the stadium is composed into the element of the macroscale, Vistula's escarpment, and thus also the scale of the entire country, or perhaps even more. This way we become an integral detail of a grand game. As the stadium faces the valley of a huge river, this feeling of scale is even further amplified. 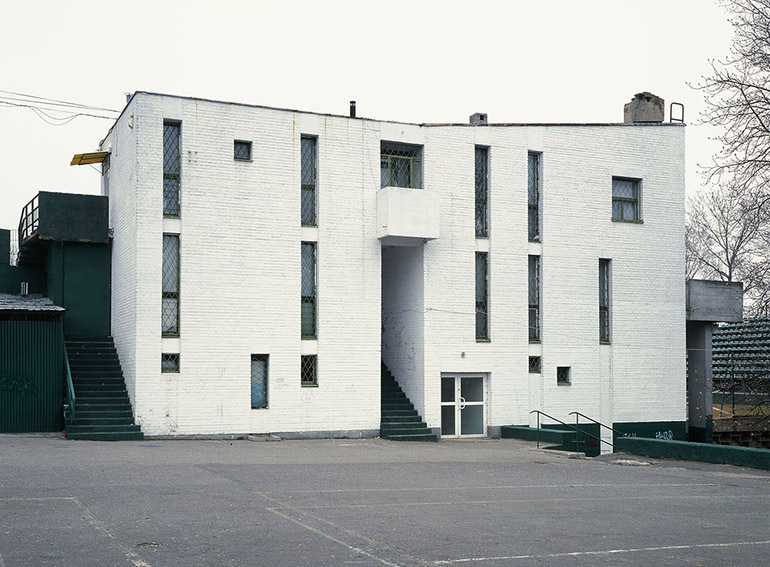 Without a doubt, the sports complex Warszawianka' was conceptually exceptional for its time. It would have also been exceptional today, when architecture integrated with landscape, created with respect to nature, is estimated highly. Unfortunately, the terrain of 'Warszawianka' has been devasted throughout the years. At the top of the escarpment, a swimming pool was built in the half of the 1990s, and the former open-air bathing area was replaced with fenced blocks of flats. The stands of the stadium are covered with bushes and trees (some of them allegedly atypical for such places) among which one can find remnants of the characteristic concrete retaining walls designed by Lech Tomaszewski. In 2016 Okolska association, Masław association and the Museum of Modern Art in Warsaw organised an international competition for a revitalisation project. The project group Centrala and Skwer Sportów Miejskich won the first prize. The designers wanted to go back to the innovative concepts of the Artistic and Research Unit of the Academy of Fine Arts – recreate the arrangement of greenery, watercourses and earthworks and construct sports and recreational buildings there. Sadly, all of the ideas awarded in the competition have now been put aside and the future of what remains of 'Warszawianka' is still unclear.